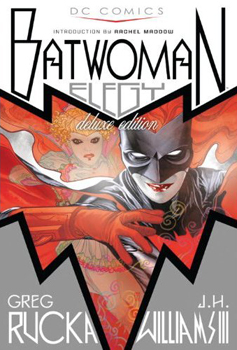 I don’t even know why I’m listing Batwoman: Elegy as part of the BookBin2010 project other than the obvious reason that it’s a book that I have recently read. However, it is not a book that was for even a nanosecond considered as a possible candidate for donation. Oh no. This is a book that is going to stay with me for a very long time. There are some amazing things transpiring in this graphic novel, which is a compilation of the story arc that originally appeared in issues 854-860 of Detective Comics. I don’t want to say much about the story itself, which is brilliantly written by proliferate comics writer Greg Rucka, other than it is expertly crafted to give readers a roller coaster of a ride for the present-day battle with villainous Alice, a psychopathic cult leader who speaks mostly in Lewis Carroll quotes, while weaving in flashback moments that give us a proper foundation for Kate Kane’s transformation into Batwoman. However, what I find most stunning about this compilation…what I keep coming back to on an almost daily basis since I received my copy from Amazon…is the magnificent artwork by J.H. Williams, III. This is the whole point of the graphic novel after all, isn’t it? To take a powerful story and increase its impact through glorious full-color artistic renderings? Williams fulfills this purpose in mind-blowing ways that are sharpened to even greater impact by amazing color work by Dave Stewart. Simply put, this is a masterpiece of storytelling, artistry, and coloring, making Rucka, Williams, and Stewart an unstoppable Holy Trinity of comic book magnificence. I want so badly to post some of Williams’s art here, but most of my favorite images from the novel give away far too much if you are as attentive and intuitive as I know many of my denizens are. This is also why I urge you not to do image searches on your own. There are several sites that post some blatantly surprise-spoiling images from Elegy. Do not spoil this one for yourselves, denizens. Trust me on this one. Final Verdict: Get your own copy of this compilation as soon as possible…because there’s no way you’re borrowing my copy.